Engineering Projects in Community Service (EPICS) is a service learning human centered design program where students integrate vertically to solve community problems using engineering solutions. Today there are 21 EPICS University Partners. Drexel is a partner school in the EPICS program. Please contact us if you would like to partner with the Sales Lab for a project. Dr. 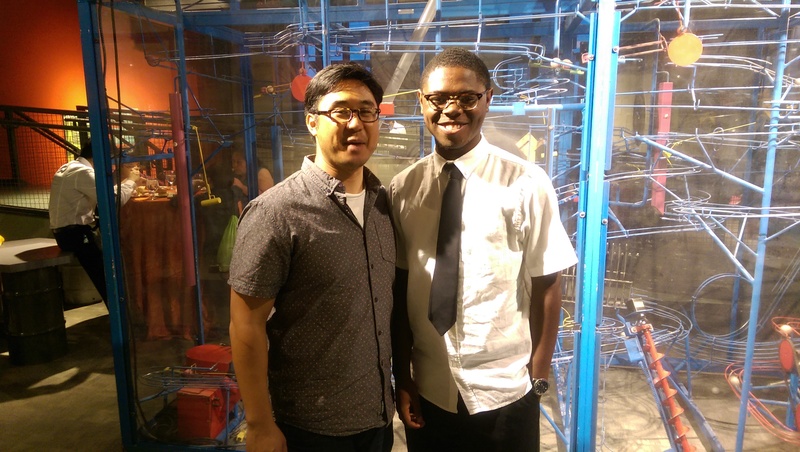 Sales and Kayin, our 2014 FI Summer Scholar, at the Franklin Institute. The Sales Lab group has mentored FI STEM Scholars for the past two years (Summer 2014 and Summer 2015). The Louis Stokes Alliance for Minority Participation (LSAMP) was established in 1994, initiated by prior funding from the NSF Comprehensive Regional Center for Minorities (CRCM) grant. A blueprint to substantially increase the numbers of underrepresented minorities earning baccalaureate and advanced degrees was created with input from the partner institutions. This blueprint would establish recruitment and retention strategies at the college level to promote minority talent in STEM disciplines and cultivate interest for continued study at the graduate level. Since its launch in 1994, Philadelphia AMP and its partners have more than doubled its minority science, technology, engineering and mathematics (STEM) B.S. degree production from 201 to 500+ annually, and has generated 8,400+ minority STEM BS degrees, 1,800+ minority MS STEM degrees and well over 200 minority STEM Ph.D. degrees in the last 16 years. As of June 2010, three Bridge to the Doctorate program graduates have received their Ph.D. degrees and moved on to professoriate, federal agency, and military appointments, respectively. Nine addition students are on schedule to complete their doctoral degrees by June 2011. W. B. Saul, part of the School District of Philadelphia, is a magnet school in the agricultural fields and is the largest agricultural farm high school in the United States. Paper Published: Price et. al 2016 in Env. Sci. : Water Research & Technol. Paper Published: Price, Shieh, Sales 2015.